Have I mentioned yet that I love Fall? Another reason for this love is fresh pears! They are great in so many desserts, as well as just on their own. 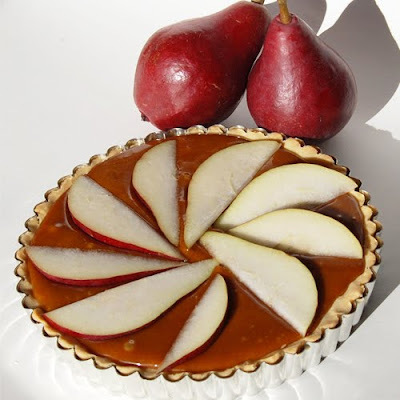 Here is a rich caramel tart with some fresh pears I got at the Farmer's Market! My favorite part about this recipe? I don't use a candy thermometer, you judge your caramel by color, and there is a tiny bit of wiggle room, but don't walk away or you are sure to burn it and then we'd all be very sad. Start with your tart shell. This recipe will yield a crust for one 10 inch tart shell. I happen to have a 7 inch tart pan, so I had some extra, I can verify that it wrks quite well if you want to shape it by hand into a Galette and be more rustic, as that is what I did with my extra dough and some pears. If you lack a tart pan, I'd go this route, it's still super tasty. To make the dough, start by creaming your butter and confectioner's sugar, then add the vanilla extract and egg yolk, until smooth. Then add in your flour and mix until combined. Form dough into a disc and refrigerate for about 30 minutes to let the dough firm up a bit. On a floured surface, roll out your tart shell (about 1/8-1/4" thick) and put it in your pan. Don't worry if it tears, you can stick it all back together in the pan, this dough is very forgiving. In a 325 degree F oven, blind bake for 15 minutes (I place parchment paper over top and fill it with some beans. I keep my beans in a clearly labeled bag so I know not to use them for anything but blind baking crusts--they will not taste good after doing this). After 15 minutes, remove the beans and parchment and bake an additional 10-15 minutes, until the dough starts browning slightly around the edges. Remove from oven and allow to cool. This can be done up to one day in advance (for those of you not having time to do the whole dessert in one day). For the caramel, start by placing your water, sugar and corn syrup in a fairly large pan (when you add the butter and cream at the end it will bubble up quite a bit, so leave plenty of extra room) and place on stove top burner at medium to medium high heat, stirring occasionally. Once your mixture starts to bubble up you will want to stir continuously, but slowly, and start monitoring the color. Once your mixture is a medium to dark amber, you want to remove it from the heat and add your butter and cream. I generally get my husband to help me with this so I can stir while everything is being added. Keep in mind that the caramel will continue to cook once removed from the heat, so don't let your sugar get too dark. I generally stir my caramel until it stops bubbling entirely. This time around I added 1/4 teaspoon cinnamon to my final caramel as well, this is optional but sure does smell and taste wonderful! This caramel also makes a great fruit dipping sauce as long as you keep it warm in a fondue pot. *If refrigerating, make sure to remove and set at room temperature for 20-30 minutes before serving. I am loving the pinwheel-swirl effect of the slices on top of your pie...I bet it will look great on my new tablecloth. Next stop : a candelabra to go with that. i'm gonna go shopping. 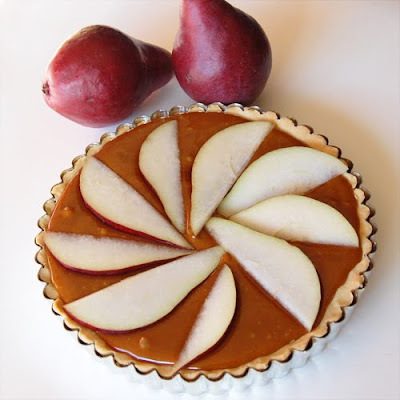 Sounds wonderful.... caramel and pears everything is perfect for a fall dessert. good thing i bought pears today!! thanks for the recipe :) yummm! !